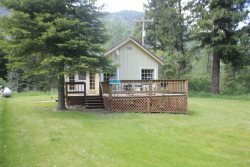 Our rental occupancy is in the range of 75 to 140 nights depending on the amenities of a cabin, a cabin's size and if the cabin is rented during the winter months. We take from 2 night to monthly bookings which results in many cabins filling most night in July and August. For example, reasonable numbers for a 2 bedroom 1 bath would be rental nights of: May =10, June =20, July =27, August =27, September =10 and you are at 94 nights. Include October through April for 20-30 more nights. These occupancy numbers net our owners $6,000 to $18,000 after our property management fee. Your net income could allow you to cover the cost of building a structure on an existing parcel. We would be happy to provide a detailed yearly income estimate for any property you own or wish to build. Each guest must check-in at our office ensuring occupancy limits are maintained. It is very difficult for a guest to overcrowd a property when all cars must be registered and all people are counted at check-in. Most guest damage occurs as a result of large groups staying in a cabin. Our guests continue to visit us every year giving us a 55% repeat customer rate. This is achieved by guest comment sheets feeding our service improvement process. We have a web site which is continuously being enhanced. We have engaged world class talent to perform search engine optimization resulting in us being in the top three for all relevant search strings (e.g. "Wallowa Lake", "Wallowa Lake Lodging", .. ). In 2017 we plan several additional improvements which will generate more traffic to our site and continue to fill our cabins. Wallowa Lake Resort takes representing its property owners very seriously. We work tirelessly for the best possible value for all services received from the plumber we hire to the pest control specialists. We always use a service on our own cabins before recommending it be used on your cabin. Detailed monthly income statements are provided to our owners which include receipts for services. Most importantly, we ask each guest to provide comments on each cabin and/or post comments.